New construction of a 30,000 SF 2-story building that will meet the needs of low-income individuals and families in Redmond. Services will include: Grocery store style Food Bank, Emergency Financial Assistance Heating/Energy Assistance, Case Management, GED Classes, English for Work, Employment Services, and Financial Coaching. Hopelink’s Administrative Offices will house the offices of Hopelink’s leadership team, Human Resources, Finance and Development Teams. Hopelink’s Administrative Offices will house the offices of Hopelink’s leadership team, Human Resources, Finance and Development Teams. Also included in the project is a large public plaza with farm-to-table gardens, a surface parking lot with 74 parking stalls, and a series of pedestrian paths connecting visitors to public transit and to the existing Sammamish River public trail system. The LEED Goal is Gold Certification. The Downtown Silver Cloud Hotel expresses a unique modern form that is shaped by a direct response to the ever changing and lively dynamics of the urban site context. Located in the heart of the Belltown neighborhood, visible from the downtown core and kitty-corner to Cinerama, this 22 story building features a two-story lobby, bar-lounge and restaurant that engages the street with outdoor sidewalk seating and valet service. The hotel has 176 modern and sophisticated rooms with full access to luxury amenities on the top two floors including a Conference Center with sweeping view of the waterfront, a Fitness Center, and a premiere urban oasis and catered event space featuring a Bar/Lounge, Outdoor Deck and Pool Area. The proposed development seeks to aid in the aesthetic direction of this rapidly changing area. It’s direct context is primarily made up of office buildings, parking lots and future mixed use high rises, currently under construction. With the use of glazing and light, contemporary materiality as well as inspiration gleaned from the Art Deco aesthetic of historic downtown Seattle, the design will reinforce the sense of place while adding to the contemporary vocabulary of the evolving neighborhood. The design will incorporate a fully glazed first level, creating maximum visibility and play between exterior and interior space. This will also create a visually exciting affect of a floating structure above. The first floor will contain commercial, restaurant space the hotel lobby, and a gym. Levels 12 through 16 will house market rate apartments with landscaped exterior spaces. This project will help fulfill the need for added hotel use in Downtown Seattle while also creating exciting and engaged commercial space accessible to the greater community. It is ideally located near many modes of public transportation and is in a highly walkable neighborhood. 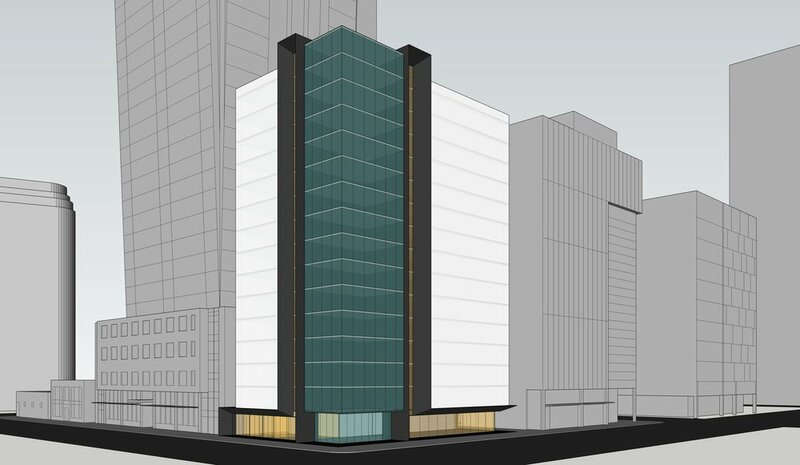 This adaptive re-use of a 1920’s era building in downtown Seattle will use the existing six story structure as a base to add 8 additional floors, creating a vibrant addition to the Belltown neighborhood. The development consists of a ground floor restaurant and bar, a Cambria Hotel with 156 units and a rooftop patio.